The club caters for players of any standard and both Association and golf croquet are played. There are currently over forty members. New members are always welcome and coaching is available for beginners. Club members do all the mowing and regular lawn maintenance. The club organises internal competitions for members and runs several tournaments each year which are open to any member of the Croquet Association. It enters teams in national club competitions and the local leagues organised by the East Anglian Croquet Federation. Wrest Park supplies the players for the Bedfordshire team in the Inter County Championship. Members can play at any time on weekdays and at weekends. Thursday evening is by tradition a club night, and members will often follow their games with supper in the local pub. The club also hosts croquet evenings for groups such as the Round Table and the 41 Club. 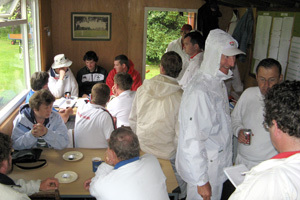 Drying off during the 2007 Home Internationals.